The National Trust for Scotland (NTS) has called on the Scottish government to give heritage sites greater protection in new planning legislation. The charity said Scotland's heritage was threatened by developments such as new housing near Culloden Battlefield and a golf course at Coul Links. The government said it was committed to having a planning system that "works for everyone". 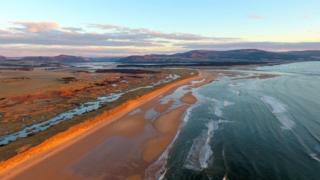 Ministers are still considering whether to call-in the Coul Links plan. They have decided to give themselves more time - 28 days from 1 August - to make a decision on whether or not to call it in. With the Planning (Scotland) Bill set to enter its second stage at the Scottish Parliament in September, NTS said this was the "ideal time" to revise the current process and build a system that protects heritage for future generations. It said developments were being given the go-ahead in, or near to, sites protected by designations, such as Sites of Special Scientific Interest, and has concerns that the protections were being seen as meaningless. The trust said four new development applications have been submitted for sites at Culloden. Simon Skinner, NTS' chief executive, said: "Culloden and the Coul Links are just two examples of a worrying trend: Scotland's heritage is too often being cast aside for short-term economic gain. "Four years ago, we argued for a planning framework which has the long-term wellbeing of our heritage sites built into it. "That can only be achieved by overhauling the current diffuse focus on individual planning applications in isolation. "Now is the time to make that change." In June, Highland councillors voted to grant planning permission for the controversial Coul Links golf course. Part of the 18-hole championship course near Embo in Sutherland would be on a Site of Special Scientific Interest. Council officials had recommended that councillors refuse planning permission. The developers of the course welcomed the vote, while opponents want Scottish ministers to call-in the project for further scrutiny. In May, the design and layout for 16 homes opposed by a campaign set up to protect Culloden Battlefield were given planning permission by councillors. Highland Council's environment, development and infrastructure committee backed the plans by 12 votes to eight. The original application for the homes was refused planning permission by Highland Council. The developers appealed and planning permission was granted by a Scottish government-appointed official in 2014. In its response to NTS' call, the Scottish government said: "The primary responsibility for dealing with planning applications rests with the local planning authority. "We're committed to ensuring we have a planning system that works for everyone, recognises the special significance of sites and ensures local communities have a say in their future." On Coul Links, the government said: "Ministers had an initial 28 day period to consider the application for a golf course at Coul Links after Highland Council notified them it was minded to grant planning permission. "In order to fully consider the application ministers are extending that period by a further 28 days from 1 August to consider whether or not to call in the application for their determination." Conservation groups opposing the golf course, including RSPB Scotland and Scottish Wildlife Trust, have welcomed the extension. US businessman Todd Warnock, who is involved in the golf project, said he was not surprised ministers had decided to take more time. He said it showed that the government was taking the application "very, very seriously".